Asheville Playgrounds is North Carolina’s premier design builder of custom, handcrafted playgrounds and tree houses. We construct our projects for developments, parks and campgrounds, schools, churches and backyards. In addition, we specialize in architectural theme playgrounds and rustic natural playgrounds for residential or commercial use. Developing each design with your dreams in mind, we hand-build each unique playground with materials that are time-tested for strength and durability as well as resistance to the elements. These include naturally rot-resistant locust wood, pressure-treated lumber, recycled plastic lumber and composite decking. Then we expertly install each custom creation at your location, anywhere within 750 miles of Asheville. Have some fun and explore our website. Enjoy the pictures in our gallery. And when you’re ready, contact us by phone or email to learn how we can get started on your Asheville Playground today. Fun for one, fun for all! A place for inspiration and fun! A great addition to your local park! The perfect playground for your school or campground! Combining your imagination and our quality craftsmanship. Using natural materials and landscapes to build fun! Something different. Something special. Something just for you! “This company built us the playhouse of our dreams! Quality and safety are top priorities at Asheville Playgrounds. Owner Evelyn Anderson is a Certified Playground Safety Inspectors (CPSI), certified by the National Recreation and Park Association (NRPA). The CPSI certification program provides the most comprehensive and up-to-date training on playground safety issues including hazard identification, equipment specifications, surfacing requirements and risk management methods. 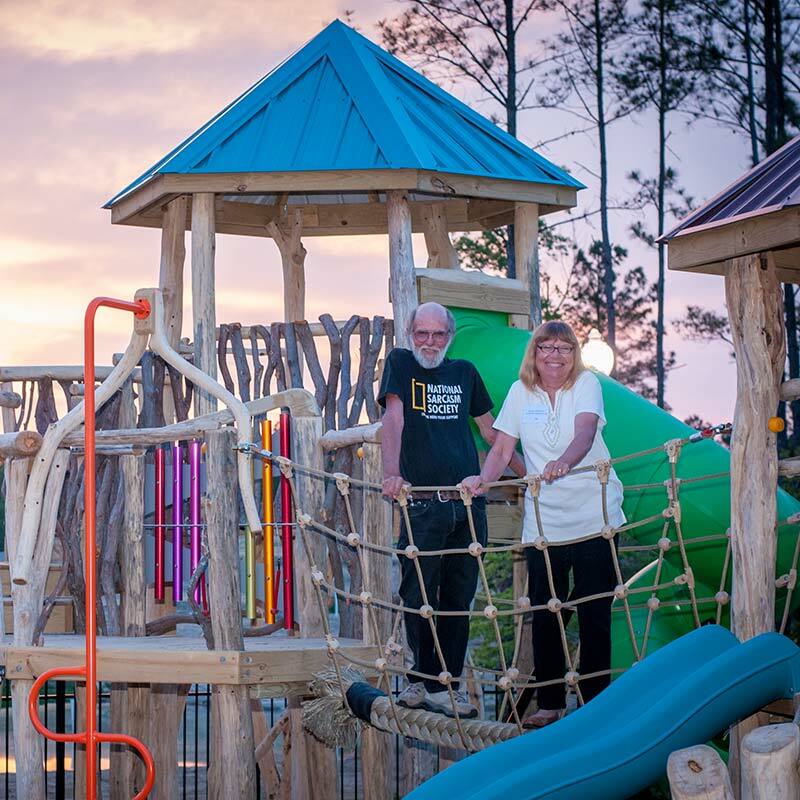 The owners of Asheville Playgrounds are also members of the National Playground Contractors Association (NPCAI) which is an organization that helps network qualified builders in the industry to promote continuous improvement in the field of playground construction. Co-owners Evelyn Anderson and Jerry Hajek attend the annual NPCAI conference whenever possible. Through every step of the design and building process, Asheville Playgrounds is ensuring the safety and quality of your new playground. Surrounded by the colorful Blue Ridge Mountains of western North Carolina, Asheville is an outdoor haven for adults and kids alike. Even if you don’t live in the Asheville area, Asheville Playgrounds may be able to make your outdoor dreams come true! We do custom builds and installs within 750 miles of Asheville… covering a large portion of the central and eastern United States!